About an hour away from the bustle and hustle of life in the greater Manila area, Tagaytay is a nice getaway. Because of the beautiful climate, it is very relaxing and a breath of fresh air compared to the city. Tagaytay has grown some of the most beautiful flowers in the country. They supply flowers in Manila and other cities. Along the highway, you’ll see lots of vendors selling plants and flowers. You can’t help but stop by for a few minutes to buy some and take home. Tourists and locals alike enjoy the tranquility Tagaytay has to offer. It is so peaceful, that they call it the “Center of Spiritual Retreat.” It’s perfect for anyone who loves to meditate and do yoga. 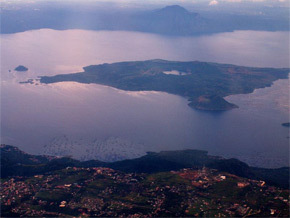 Tagaytay is a perfect venue for a picnic, horseback riding, camping and sightseeing. If you ever travel to the Philippines, make sure to include Tagaytay in your itinerary. It’ll be an experience you’ll never forget.